My bulletin board has motivational thoughts pinned unto it. “A good story is one that has changed you.” “I am organized in my writing.” (Where did that come from?). You do not have a story until something goes wrong. The stained glass window was made by my sister, Diana, and is on the cover of my memoir Mourning Has Broken. 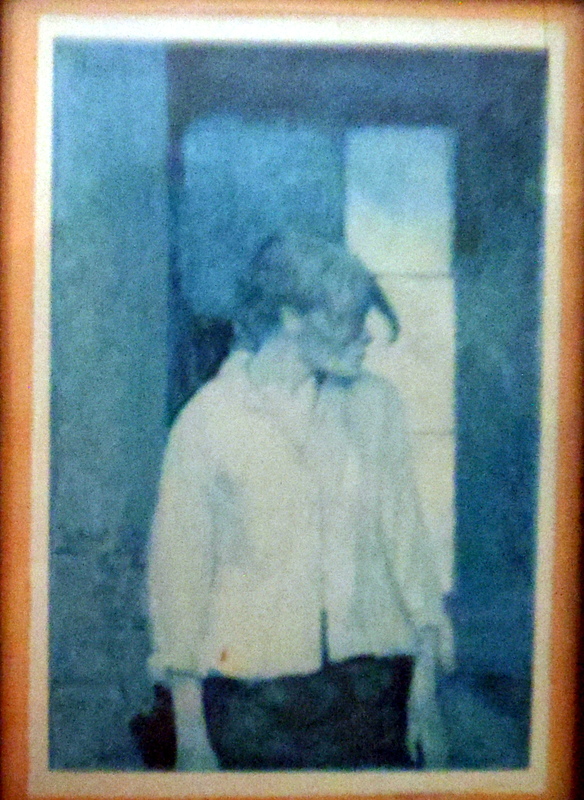 This is a postcard of a painting by Toulouse-Lautrec that is on my bookcase. It was inspiration for my character, Annie, in my WIP novel The Protectors. My writing day usually begins and ends in bed. This entry was posted in Writers Desks and tagged Bloomsbury, E.M. Forster, Eamonn McCabe, Isabel Allende, Steven James, Toulouse-Lautrec, Virginia Woolf, writers desks. Bookmark the permalink. I have chosen Maya’s Notebook for our next book club to compare it to Roxana Robinson’s Cost.I did read Paula, awhile back. I liked it but then I tend to like everything Allende writes. She’s an excellent writer. I wonder in which way she’s copied Garcia Marquez. You probably noticed how faded the Lautrec postcard is. My character has been in my head a long time. How interesting that there are two cities, one called Lautrec (one of the most beautiful cities in France) and the other Toulouse and that the famous artist is named after them. 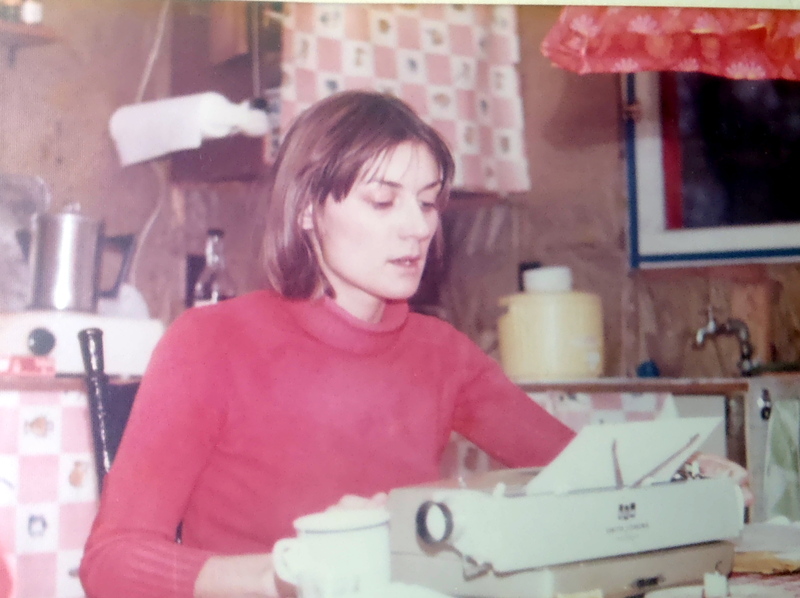 Carol – Thanks for sharing your writing space with us. I really like that it reflects your past as well as who you are now. 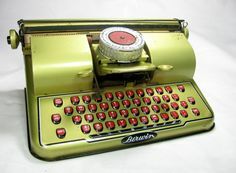 PS I learned to type on a Smith Corona too. Remember the liquid paper and the yellow strip to correct mistakes? How tedious it all was. I can’t imagine going back to such a typewriter and yet great writers wrote their entire works’ collection on typewriters. You’re welcome 🙂 You have a nice weekend too! My main writing space is me propped up with pillows in bed and a lap desk with my computer. I also have a lovely desk in the office I share with my husband. There’s a writing process flowchart and a frame painting of a vineyard in Florence hanging on the wall to mind me where I’d like to spend part of my retirement years writing. Two layers of shelving are above the desk (I’m tall) with writing craft books and other stuff. In bed propped up with pillows. What a luxury. This is one of the advantages of being a writer. One can write anywhere but Florence sounds like a perfect place to write. I think this is my favorite post of your whole series. Wow–talk about personal sanctuary-and how so many items you’ve chosen to keep in your room has meaning. Really inspired by your writing space and I’m so glad you included it, Carol. Thanks, Debbie. I got that quote at a yoga retreat a few years back. It reminded me to trust more in the Universe and my intuition. To listen more to my heart and not be so much concerned with outcomes. I LOVE that E.M. Forster quote. I’ve added it to my favorite Goodreads quotes. Thank you for bringing it to my attention! Your welcome. Have a look at my comment to D.G. Kaye about the Forster quote. Carol, I love this post. Helpful, too, while I’m reading your book ;). I’m now focused, Drew, on the Femme Fatale series and I’ll continue to post women Nobel Prize Laureates and other things that come up. My summer is filled up to the brim and writing is not one of my fillers, sorry to say. But I love my grandkids, and of course, being with my family in whatever they are in need of the moment. Femme Fatale sounds intriguing. I listen to audio books at night but not for long so it will take some time to get through The Goldenfinch. I want to download some pictures that I took today and post a couple. Hugs. And yes, my poetic flies in more ways than one. Ha, ha! You may not be writing but you’re creativity is showing through your amazing photography, Drew. I like audio books. They’re less effort than reading, I find. Thank you Carol. I do enjoy the grandchildren so much. They are very active and do play me out, but that is not a bad thing. I like audio books too. I listen at night when I go to bed. It helps me fall asleep. Takes my mind off of worries which I can’t do anything about anyway. I have two kinds of cataracts. As time goes on, I will need surgery to remove them, however, in the mean time I don’t see as well as I would like. But I can read still though listening is comforting and less stress on my eyes. It’s a gene thing. All my family has had these eye issues, but none went blind. You have a happy day tomorrow as well. Hugs, my friend. I’ve enjoyed this series . . . but THIS is my favorite of your posts in the series. Adore that shot of you in the cabin and your writing space looks inspiring. Thanks for posting these links. They’re great and I hope others will click on them as well. I saw your comments on SLTW . . . if you want to feature blogger’s writing desks, do it! Most will be different than the ones shared on SLTW. And visitors found it great fun to see where their fellow bloggers wrote. 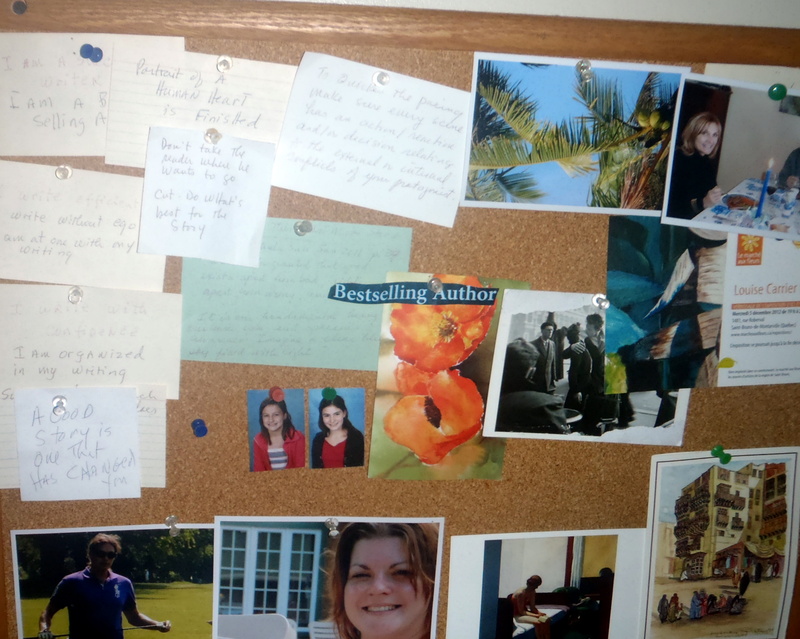 Carol, thanks for your beautiful series on “writing spaces” and sharing your own. I find it heartening that so many writers create a special space for themselves and honour it as you have, with meaningful and inspiring objects such as the beautiful stained glass window. Giving ourselves this sacred space also gives us permission to write what’s in our hearts! I give my writing its own room, complete with custom-built bookshelves, a solid desk and computer table. The brick wall I look out at is perfect for writing … and the room gets lots of natural light which is great for the tropical plants near the window. Bravo for all your hard work and providing a place where others can share their views on your posts. Thelma, thank you for your thoughtful comments. I like that you used sacred spaces in reference to writers’ desks. And that in honoring that sacred space we ought to write what’s in our hearts. That is when writing is most interesting. Your writing space seems so functional and peaceful with the plants and window facing a brick wall – no distractions. Thank you Carol Ann. I have read your Writing spaces with delight and I now finally acknowledge it. I hope we run in to one another this summer and celebrate. I love the ‘then’ and ‘now’ photos. You have indeed come a long way. I am not a crime writer reader, but I have finally ordered your Mourning has Broken direct to my new iPad. I can’t believe how easy this is. Look forward to reading it (though I have a fearsome reading queue, so it will be a while). Like you, I too have a fearsome reading queue…there’s so much to read! MY SPACE…? EITHER A SECURITY DESK AT AN UNKNOWN LOCATION, AT MY BEDSIDE FACING AN N-SCALE TRAIN LAYOUT THAT STILL DOESN’T RUN….OR…IN EXTREME WRITING NEED….ON THE TOILET ( ! ) USING A PAGE OF MY WIFE’S WORD PUZZLE NOTE BOOK TO WRITE A SUDDEN IDEA!!!!! I do! I actually keep a pad of paper and pen in my bathroom. I have been known to jump out and joy down a few wet notes! I LOVE that quote about life. My writing space isn’t near as centralized yours. I have small note books and candles everywhere. I gather them together at the end of the day though, and spend time reviewing them in the morning over coffee…we all have our “way”. Candles adds such a special touch. For me, having candles around means slow down and they also signal inspiration. I should light them more often. I really like that quote. It’s been on the wall of my office for years; a reminder to go with the flow, to be open to surprises. I love the Forster quote. I hope you have a chance and time (I realize how many other blogs we want to read) to have a look at some of the famous writers’s desks. I had a lot of fun researching and writing this series. Thanks a lot, Christy for being here. Your comments are always gratefully appreciated.